Inflection Point Systems ranked as the 10th best company to work for in Mexico in the IT and Telecom category in 2013 according to the Great Place to Work Institute. This award represents another significant milestone in the history of the company, and a result of Inflection Point’s focus on creating an exciting culture and place to work for its employees. The year 2013 has seen multiple Great Place to Work awards for Inflection Point. In April, the company obtained the 4th place in the ranking of the best companies to work for in Mexico (50 to 500 employees category). Shortly thereafter in May, it was named the 26th best company to work for in Latin America in the category of 50 to 500 employees. Being a great place to work is a source of pride for the Inflection Point team, since it represents a special emphasis by the company in providing a fantastic working environment and building a great culture based in its core values of respect, communication and balance, among others. Inflection Point’s values are crucial and they are present in all daily interactions among employees. Consequently, the company was also recognized as #1 in the category of Respect by the Great Place to Work Institute this year. “It’s been 3 years since we started participating in the Great Place to Work rankings and over this period, we have made significant strides in improving our culture and work environment. These awards belong to the Inflection Point team. It is solid proof that we together keep building a great company culture on a daily basis. Being the 10th best company to work for in Mexico in the IT and Telecom category in 2013 is a tremendous honor. We will continue to redouble our efforts to keep improving in this regard, since happy employees are productive employees that ultimately deliver a high quality service to our clients” said Carlos Montemayor, CEO of Inflection Point. Inflection Point plans to continue focusing on its employees’ life balance and promote the company’s core values of fellowship, integrity, respect, excellence, teamwork, balance and growth with the objective of maintaining the best work environment possible for its employees. 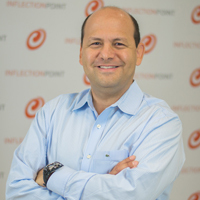 CEO and Co-founder of Inflection Point, President of the US INSEAD Alumni Association, MBA, and MSEE, Carlos has more than 25 years of professional experience and key leadership positions in engineering, management, business consulting and business development and sales. He enjoys traveling, skiing, art and history and loves dogs. He likes to blog and share his insights on business and technology.